Sip, swirl, explore and learn about various wines with a fun, relaxed and informative tasting party – all you need is an hour or two at any gathering or occasion. Do you drink wine? Do you want to know more about wine? You need The Wine Guy! Parties start at 6 wines for up to 8 people! Feel free to suggest a theme, or a variety of wines will be chosen. More discerning palate? I can customize every party to any taste or budget. Tasting will be informative, fun, and relaxed – never snobby! Tony Gallo is The Wine Guy. TG has been tasting wine for 15 years, but he's been drinking for 30+ years! It all started with his Mom, Nancy Gallo, after her trip to California in the 80’s. 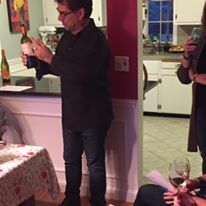 From there, TG & Mom took a wine class with the astute Howie Rubin from Bauer Wines in Boston. TG was instantly intrigued by the different flavor notes, countries of origin, and characteristics of each bottle. In the last 12 years or so Tony has been surrounded by wine and wine people mainly through his working at Market Wine & Spirits (now Busa Wine & Spirits). Manager, Mike Gillen and good friends such as John Murphy, jump-started and helped build upon Tony’s knowledge and understanding of wine. Many tastings, occasional seminars and weekly gatherings with the wine people led to TG The Wine Guy. Share TG's love and appreciation of wine at your own tasting party! Entice your senses, expand your knowledge, and create some amazing memories! What a great night Tony Gallo ! The Wine Guy is available for your event in the Greater Boston area! Tasting parties include 6 various bottles of wine (for up to 8 people), 8 bottles of wine (10-12 people), or 10 bottles (13-16 people). Wines start in the $10-15 range, but I can also do premium wines ($15-25) for additional cost. Cheese or charcuterie boards and pairings for up to 12 people can be provided as an add-on. A detailed pricing sheet will be available soon. Contact The Wine Guy below to inquire about availability for your event below!